How do we know what we’re doing is working? Who are the people we should be reaching out to? What is social influence based on and do we have any? Aren’t there tools out there to help us figure this stuff out? Luckily, yes, they are tools. And while I don’t think any one tool has gotten it completely perfect (yet), the truth is there really are a number of options to help you benchmark your social influence, understand what’s working and what isn’t, and even some that offer recommendations on how you can improve your social media strategy as a whole. 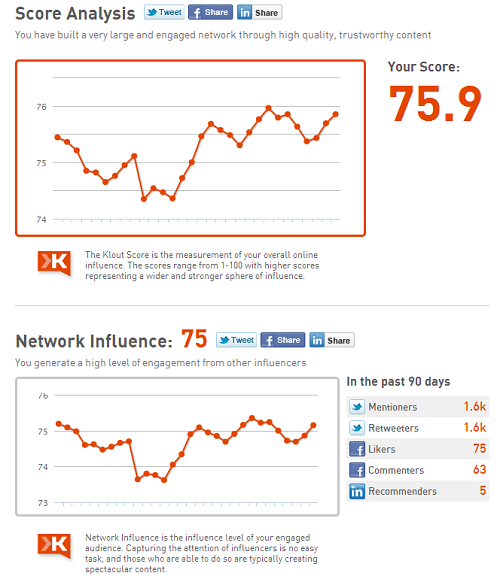 Klout Score: A measurement of your overall online influencer. 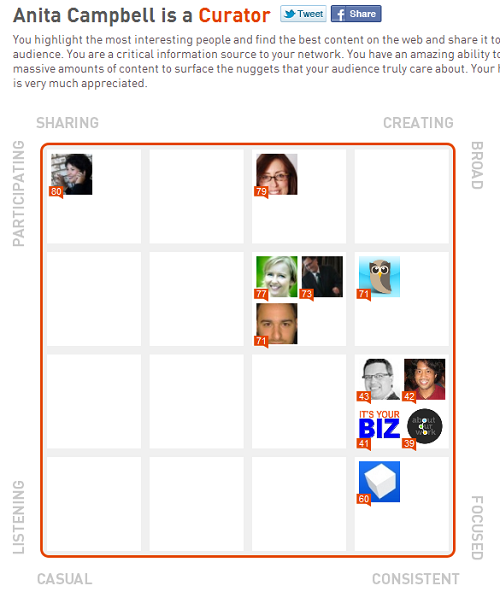 Network Influence: The influence level of your engaged audience. Amplification Probability: The likelihood that your content will be acted upon. One of the most interesting areas of Klout, for me, is the ability to compare not only Influencer scores but to dig into the types of Influencers people are and what their activity looks like. For example, SmallBizTrend’s Anita Campbell is identified as a Curator and we’re able to see why and how that activity is different from others. While there are certainly plenty of bugs, I do think it’s one of the better tools we have right now to map influence and to determine who may be influential about certain topics and how their influence ranks among their peers. Klout may have more brand power than Twylah, but I think Twylah trumps everyone in terms of being interesting and what the service is actually able to provide. Though listed second, this is my favorite tool on the list. Twylah stands out by adding context to your tweets and creating a whole new experience around them. The service doesn’t just tell you what you and others are influential about, it shows you WHY you’re influential by placing a user’s “trending topics” (what you tweet about most often) into clickable, topical buckets. Now you know. You’re able to see which tweets built this influence. Personally, I really like that Twylah doesn’t determine influence by an arbitrary number, it does it based on the context of your tweets and how much engagement they receive (Retweets, replies, etc). Once you’ve used Twylah for a while, the service will send alerts to let you know which topics are important to your followers. As you can imagine, this is really handy in knowing what your circle wants to read so that you can target content toward them. Outside of just being a neat tool to display what you’re influential about, Twylah essentially gives you a new way to promote your tweets to your audience. You can even put it on your own domain so you’re not sending people away AND you have some control over the topical buckets that Twylah uses for your brand. Love. TwentyFeet gives you a graphical view of how you’re influence is doing on various social media channels. The service allows you to track one Twitter account and one Facebook account for free, and then offers the option to pay for additional accounts at $2.50 a year. Yes, $2.50 a year. Once you’re set up, TwentyFeet will monitor your account and keep track of certain key performance indicators like Reputation, Influence, Conversations, Following analysis, Lists, and other information. You can also change the period to look by quarter, month, last week, etc. One thing I like is that clicking on any of the topic buckets will bring up a list of others who are influential about the same topics, along with their PeerIndex score, Twitter handle and other data. If you’re a SMB looking for people to engage related to your topic, this can be really handy in identifying influencers to reach out to. Also cool is that PeerIndex gives you a list of the top content sources that yourself or other users share. 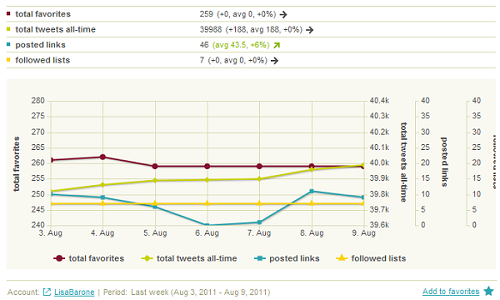 For example, which sites am I most often hawking? Yup. That’s a pretty good list of my favorite content publishers. Aagain, this is really handy when trying to decide which communities are worth your time to engage in and understanding where your audience is. While this tool isn’t the most sophisticated or the prettiest, it does deliver some good data for those looking to get a glimpse of whose influential about what, where they’re loyal to, and which communities should be on your radar. 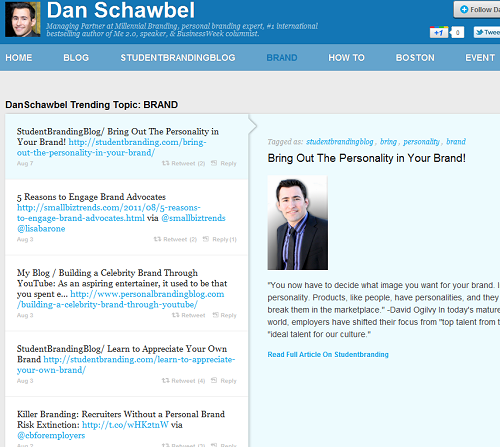 SproutSocial (which I always wrongly refer to as “SocialSprout”) isn’t a tool to measure social influence. 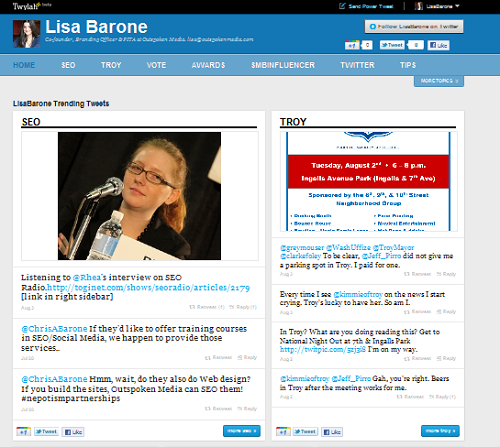 It’s a complete social media monitoring tool. However, the single dashboard provided to help business owners manage multiple accounts does a pretty good job doubling as a benchmarking tool for those inclined to use it as such. There’s even a weekly scorecard to help you keep track of New Followers, Mentions, Message Volume and Engagement Levels, as well as data to let you know which of your links get the most clicks. I wouldn’t recommend using SproutSocial to keep track of influence unless you’re also looking for a full social media management tool, simply because that’s really its core use. However, it’s a great option for doing just that. 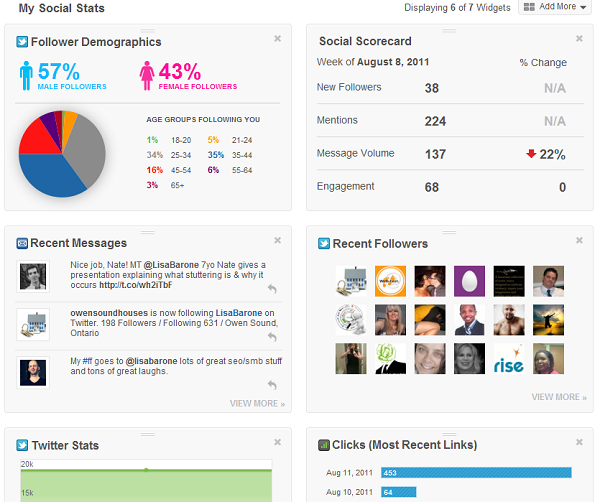 While SproutSocial is a paid monitoring tool, Pro accounts run $9 a month and Business accounts are $49 a month. Those are a handful of tools that I’m partial to for figuring out social media influence. Which ones are you using or any experiences with the ones listed here? We’d love to hear it.